Imagine visiting a friend and they offer you a nice, hot cup of nettle leaf tea. You might wonder what they might be thinking by trying to give you a cup of tea made from a plant that most people avoid in the wild! Anyone who has ever gone for a hike or enjoyed a day in the woods knows to avoid certain plants like poison ivy and stinging nettle. So why would anyone even think about drinking a tea made from such a bothersome plant? You could be surprised to learn that the positive benefits of the nettle plant far outweigh the disadvantages. Plants of all kinds have many different properties and the nettle plant is no different. The nettle itself is a perennial and coexists as both male and female plants. The one characteristic about this plant that everyone seems to know is that it has some very sharp leaves that pierce the skin and can cause an allergic reaction. The plant produces a colorless, pungent, fuming liquid acid that causes blisters on the skin when released as these sharp leaves are broken off. Yet regardless of this negative response, the nettle plant actually does more good than it does harm. Using a plant that contains acid that causes skin irritation for anything beneficial might seem strange, but for those who use the nettle plant regularly often can’t imagine their lives without it! Some people cook with nettle because it has nutritional benefits including iron, vitamin A, vitamin C, beta carotene, phosphates, tannins, calcium and iron. Some cultures enjoy boiling young nettle to be eaten as a vegetable. The fibers from the nettle plant can be spun and used in fabrics and rope. It is also a great skin cleanser for people with oily skin. Yet the most common use of the nettle plant is in nettle leaf tea. The leaves of the nettle plan have become a staple in the alternative medicine community. Herbs like nettle have certain properties that help describe their benefits. Nettle can be used as a diuretic, anti-inflammatory agent and as a way to induce milk production. Some users have also found that it is especially helpful as an expectorant when they are congested. Research also suggests that nettle has polysaccharides which are believed to boost the immune system. The leaves are commonly sought after for their anti-histamine and anti-inflammatory properties. It might sound odd that nettle leaf tea from the nettle plant has anti-histamine properties, but it does! The magnesium in nettle tea is thought to help those with upper respiratory problems especially if they have asthma and lack magnesium in their diet. Because magnesium can bring down the histamine response as well as alleviate bronchial spasms, some believe the tea to be helpful. The list of health benefits from nettle leaf tea goes on! Individuals suffering from urinary tract infections find that drinking tea from the nettle leaf to be effective and warding off future occurrences and relief from current symptoms. Women also enjoy relieve from heavy menstrual flow and premenstrual syndrome when adding the tea to their daily diet. Some of the most recent and exciting uses for the tea is in the treatment of rheumatoid arthritis. The tea itself is effective at reducing inflammation and therefore reducing pain, but some holistic practitioners have discovered that the actual sting from the nettle plant on the skin can reduce inflammation as well! The tea is the preferred method for many, but extreme cases willing to endure the initial discomfort of the sting are finding relief from their pain. 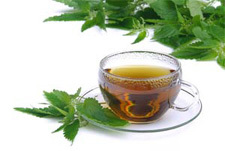 Another area where nettle tea from the leaf of the plant is being used successfully is in men with prostate problems. The tea seems to help in cases of enlarged prostate glands as well as helping with prostate swelling. Additionally, people dealing with frequent nosebleeds have been enjoying nettle leaf tea more and more because it seems to be preventing nosebleed incidents. It has also been mildly effective at lowering blood sugar levels for those working to achieve that goal. When consuming the tea, the best way to enjoy it is by using two or three tablespoons of the dried leaf and steeping it in one cup of hot water. Steep the leaves for about ten to fifteen minutes before adding any sweetener or lemon. Most people find that drinking three cups a day to be the most effective when treating their ailments. Many herbal practitioners have found a number of uses for nettle in compounds and salves, but it offers just as many benefits on its own for a large number of ailments. The nettle plant itself has over 200 species throughout the world and many people simply regard it as a bothersome “weed” that often pops up in ditches, gardens and wooded areas. The truth is that the nettle plant is part of an important ecological cycle in nature in addition to providing human beings with natural remedies for a number of uncomfortable ailments. Take another look at the nettle leaf and see what the tea can do for you. *As with any herbal remedy, please keep in mind that the recommended uses are solely from people’s personal experiences and not advice from a doctor. The tea is often preferred with a touch of sweetness or a dash of lemon.